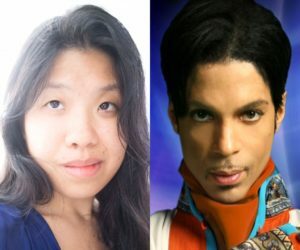 This is the story of how I discovered that the identity of my twin flame is Prince Rogers Nelson. This is a summary of events, and this document is written just over one year after his passing. On April 21, 2016, I was at my desk listening to the radio when the news came on and they announced the passing of Prince. There was something in this piece of news that I could not come to terms with. And yet, I could not understand why. Prince, whom I never followed the work of, knew very little about, and yet something inside me said that I needed to know who this man was. As days rolled by, I learned of his Paisley Park home and studio from the news coverage, and it drove me to seek out more information about who he was. I wasn’t interested in the music. I needed to know who he was as a human being. In the next few weeks, I spent my time listening to every interview of him that I could find. And I realized how much I felt alike to his way of thinking and being. His shyness and quick bursts of sassy enthusiasm. His mannerisms, his kind of fidgety hand movement. I felt really sad, because I knew in real life, we would have been good friends had we known each other. One day, I spoke to a friend about a strange synchronicity that repeated with two ex boyfriends. Both of them, on separate occasions, had once said to me the phrase, “It’s about time…”. I found it strikingly bizarre that both men would say such a thing to me. My friend suggested that if I wanted to know why, perhaps I could telepathically ask the higher self of the last boyfriend, what was that about. That following evening, I started to download Prince’s most recently released albums. I had the strange feeling that I was looking for something, like there was a message hidden for me somewhere. i listened to the album Art Official Age, and I noticed that the track, Time, contained the phrase, “It’s about time…” repeated throughout the lyrics. I was baffled by the synchronicity. The more I listened to his music, the more I felt his presence with me. It was the kind of feeling you get when someone is staring at you from behind, directing their attention towards you from across the room. I would be alone in my room, but I felt like someone else was there with me. Certain phrases in the lyrics felt like he was speaking to me directly. The next day, I was in the shower, thinking about what my friend had suggested about asking what that synchronicity meant. But for some strange reason, my mind connected with Prince, and as bizarre as this sounds, it felt like a natural thing to do. Surprisingly, I received an answer. He explained that it was a program I was given, to act as an alarm clock for me to know when the time had come. This answer made sense to me, but time for what? I did not know yet. I didn’t take this experience too seriously, until I made another discovery. Because at this time, I still thought that this was possibly something I was just imagining. 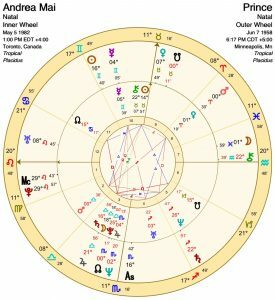 As a practitioner of Numerology and Astrology, I took a look at Prince’s numbers and astrology to see what he was all about. Something told me to do something weird. I was directed to put our natal charts together. This technique is used in Astrology for insight into relationship dynamics between two people, usually used for romantic couples. I was shocked at what I found. In all my readings that I have ever done between couples, I had never seen anything like this. His planets made the same sacred geometric patterns as mine did. His Mercury was conjunct my Mercury, with only one degree difference, which signifies our direct ability to communicate with each other easily. His Mars was conjunct my Venus, with only one degree difference, which signifies a powerfully intense romantic attraction to each other. Other aspects pointed that this man was the love of my life. I could not believe this. How cruel was the universe, that he was taken away before I could meet him? The man of my dreams was gone. And I could feel myself falling in love with him. I felt deeply troubled. I was in love with a person who was no longer here. I was in shock of what I discovered, and I needed help to sort this all out. I knew that there was only one person that could help me, Starla, a friend on Facebook, whom I had met two years ago. Starla had once given me a reading on my birthday. She has once described to me, a man that I would one day meet. She had said it was someone who travelled a lot for his work, and that he would be very interested in the Numerology work that I did, though it would not appear obvious. He was someone very spiritual, one who meditated. And he was much older than I was. At the time of this reading, I felt that this man was a musician. Now I realize that she was describing Prince. I asked to speak to Starla as soon as possible. We set up a time to meet over Skype. She instructed me to write down all the questions I wanted answered from the reading, and not to tell her anything. 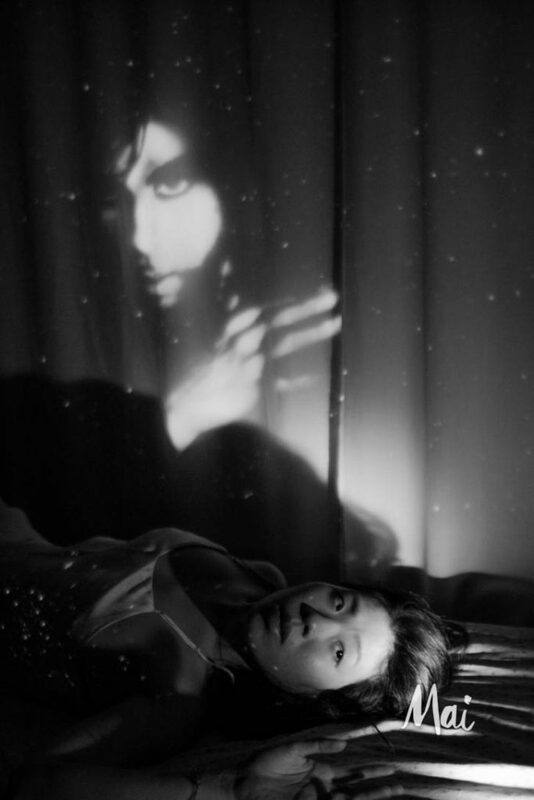 One night before the reading, I saw Prince’s lips in my dream. It was just his lips and he kissed me. In another part of the dream, I received a gift. It was a box of perfume and it had his symbol, printed on the box. I was able to smell the perfume in my dream. During the reading, Starla answered my questions precisely. She had picked up on my inner turmoil about my career as an artist, and what was happening with me. In my request for the reading, I had said I wanted to know about a man, and that was all I said. She said that she saw a man with me, and she proceeded to describe Prince exactly, not knowing who she was describing or who I was inquiring about. She had asked several times if I could disclose his identity, but I refused. When all my questions seemed to be answered, she announced that she was receiving her signal for when a spirit was present. She continued to tell me about Prince, and described his situation in regards to his death, how he felt about his career, and what he had to say to me. Suddenly, she bursted out asking, “Oh my God, is it Prince?” I said yes, and she carried on to tell me what he wanted to tell me. He explained that the reason I was feeling what I was feeling, was that, “We are the same. She is me, and I am her.” Throughout the reading, she reiterated that I was not imagining this experience, I was not crazy, it was not something of my mind’s creation. She said that during the reading, she could actually feel his energy there, but normally, she would only see visions or hear words coming from spirits. He was really there with me, present in my life, attached to my heart. After the reading, I felt an intense heaviness of energy in my chest. I knew it was Prince, he had come closer to me. Before it was described to me, that he was attached to me with a thread, and that he floated around me, like a balloon. or the next few days, I felt his grief over his own death. I saw him in a dark wooden cabin, moping around, pacing back and forth. Other times, I saw that he was resting, sleeping on a bed in a corner. At other times, I would talk to him, and console him. The weather here at this time, was so bad, I thought that spring would never come. And then one day, after a rainstorm had passed, the sun came out. I saw him sitting by the window in his cabin, the curtains open. He was reflecting, and suddenly he leapt out the window and floated onto a bed of clouds. 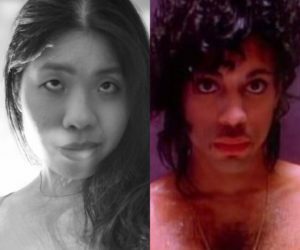 The first time I ever really looked at Prince’s photo, like really looked at his face, I noticed something strange. When I looked into his eyes, I felt like I was looking into mine. I became frazzled, “How come you have my eyes? What’s going on here?” I’ve always felt strange about my eyes, because people would notice my gaze and think I was looking at them funny. Because my pupils tend to naturally sit in an upward position. Here was someone who had the same dreamy, dazed-out look in the eyes as me. 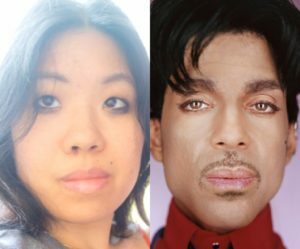 I thought that perhaps in this entire experience, that Prince and I were simply kindred spirits. I thought maybe I was just supposed to help him transition into the after world, and that would be it. I thought we were just going to be friends (as crazy as that sounds, I didn’t mind having a ghost friend). But I felt my attraction to him growing. And I was concerned for my own sanity. I thought that whatever this was, it really wasn’t fair, and perhaps he needed to go. But I felt his attraction towards me. And I couldn’t understand it. One day, I went into meditation. Prince appeared to me, taking me by the hand, saying that he wanted to show me something. We walked through a field, until a mountain appeared. It was the Swiss Alps. I did not know what this was supposed to mean. Prince is often cryptic in his communication. We often convey messages in images or thought forms and feelings, not necessarily words spoken to each other. I had ordered some of Prince’s CDS. His music was hard to come by, as half of his catalogue was not available to download through the main distribution channels. A few days after the vision of the Swiss Alps, his 20Ten CD arrived in the mail. I opened the CD to find that an image of the Swiss Alps was printed on the CD itself. 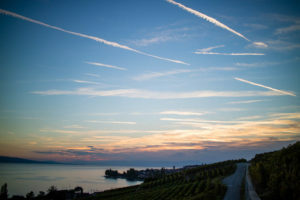 I would later find out that it was a depiction of Lavaux, as it was in one of the songs that described his love for this place. That night I listened to the track, Beginning Endlessly, and I knew immediately that he was talking about us. Then he tells me that he wants me, and asks if I would let him be my man. I said yes. I felt the love between us growing, day by day. And yet, I was still confused about what all this was. One day, I felt an intuition to put on some gold jewelry. I had heard that gold can act like a conduit for psychic energy. I thought that perhaps it might help us communicate better. You see, although from the beginning, we spoke to each other telepathically, I was still having doubts about my abilities to hear him. I thought the gold could help. Lavaux. ©2018 by Andrea Mai. All rights reserved. That night, I laid in bed, wearing a gold ring and bracelet on my left hand. I felt an energy buzzing around me where I wore the jewelry. It was the strangest sensation. I felt my arm being involuntarily lifted. I was surrounded by a field of electricity. And I suddenly felt the energy on my lips, a buzzing feeling. I felt him, kissing me. 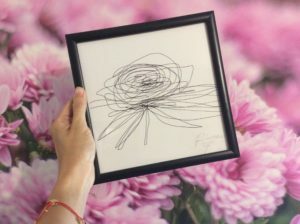 Prince’s Rose drawing. ©2018 by Andrea Mai. All rights reserved. After discovering Prince’s ability to move my limbs. I asked him what we could do with this. My arm shot up and picked up my iPad tablet. At first, I thought he wanted to type. But I found this to be disastrous, as the typing was clumsy and resulted in nonsense. 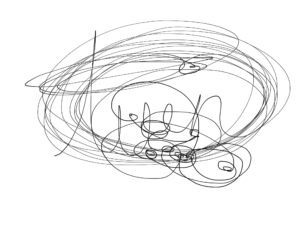 Then my finger pressed a button for drawing mode. And we began to draw. I felt his energy guiding my finger, as it glided over the iPad screen. We would write and draw. So I began to ask him questions, to which he would draw an answer. Finally, it occurred to me to ask him, what our connection was all about. What did we mean to each other? He wrote the words, “Twin Soul”. I had never heard of such thing. I had only ever heard of the term, “Twin Flames”, but from what I had heard of the term, it did not seem to match my experience at all. I asked him if it was the same thing. He answered, yes. He explained that we were created as a pair, one soul split in two bodies. One that embodies the male, the other, the female. 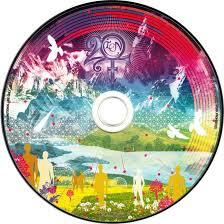 “Twin Souls” by Prince in spirit. ©2018 by Andrea Mai. All rights reserved. For many months, the topic of twin flames would baffle me. I knew that what he was saying was true. And I had even confirmed it by asking for three specific signs to be shown to me. I asked to see 11:11, an infinity sign, and a mention of him on the radio. I saw the first two signs show up in my YouTube feed, and that night, I listened to the radio, and felt him directing me to listen carefully. I was listening to Coast to Coast AM, and the guest being interviewed mentioned Prince. In the midst of all this, I had decided to go to France and Switzerland. First, I would go to France to attend my best friend’s wedding, then to Mont Blanc. And then to Switzerland to Lavaux. Andrea at Mont Blanc. ©2018 by Andrea Mai. All rights reserved. During the trip, I would receive many, many signs to confirm answers to questions I had been asking. On the way there, the lady at the airline counter, made an announcement requesting to be contacted by a passenger with the last name, “Prince”. When I arrived in Paris, my friends came to get me from the airport, and we drove to the South of France. During the ride, they played music from their phone, and a song from Michael Jackson came on. The song was This Is It. And as I listened to the lyrics, I wondered if Michael has a twin flame, and if I would ever get to meet her. The night before the wedding, I asked Prince for a sign. I asked for one of his songs to be played at the wedding. I told no one of my wish. And then at the wedding, when the dance floor started to get busy, Purple Rain came on. The next night, I asked to see a purple car, and the next day, on the way to the train station, a purple car drove up next to us. I thought it would be cool to see a purple motor bike. And in Switzerland, I saw one, and it was parked right outside of a clairvoyant shop. 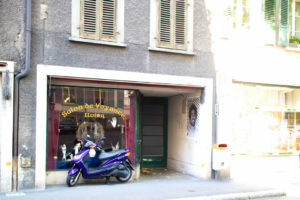 Purple motorcycle in Vevey. ©2016 by Andrea Mai. All rights reserved. When I came home, after an amazing trip, I wondered if perhaps twin flames are supposed to look alike, if that was a real thing. I searched online to see if there would be any information about it. 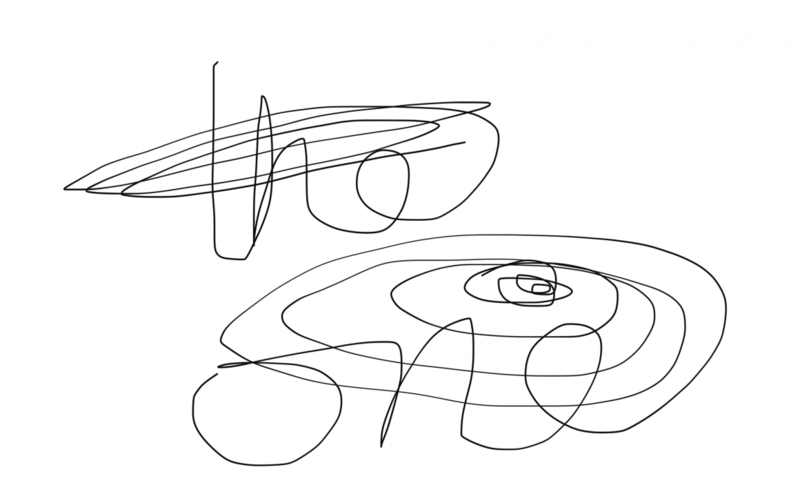 And there was. And it was written by the twin flame of Michael Jackson! 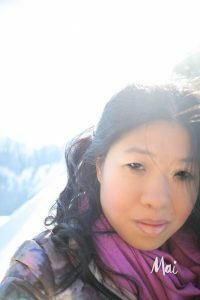 I was shocked to discover that his twin flame, Susan, lives in Switzerland, and that she was born in the same year as me, in 1982, and that both Prince and Michael Jackson were born in 1958. And that both pop stars would make their first real hit albums in 1982, when both myself and Susan were born. I read Susan’s blog to discover what twin flames were really about. And realize that everything I had ever read about the subject on the Internet was completely false. I contacted Susan and she directed me to a book called Twin Souls Merging, and it described everything exactly, all the kinds of things I was experiencing. And it would turn out to be very evident, that twin flames do look alike, especially in the eyes. They have a similar look about them, they are the male and female equivalent of each other. And that they were very much twin-like in many respects, such as the way they think, feel, act, the things they like, dislike, and they even read each other’s minds. I continued to research the life and work of Prince. And I discovered the many clues in his work that he knew of me in his dreams and felt me through out his life. I found many seemingly insignificant commonalities between us, but added up would amount to a huge long list of specific similarities between us. As more information about Prince became available to me, I begin to see just how much alike we really are, and that we were truly twins in so many ways. Prince and the Love Symbol in the background. Later, I would realize that Prince’s symbol, known as the Love Symbol, is symbolic of the merging of twin souls, and their cosmic journey to return to each other. I found out that the symbol first started to make its appearance in 1982, the year that I was born, hidden on his 1999 album cover. Researching the songs on this album, I found out that the song, Automatic was recorded on May 2nd, 1982. The song, Delirious was recorded on May 9, 1982. And during that time in between, I was born, on May 5, 1982. Automatic is a song that expresses the automatic nature of twin souls, the deep level of the connectedness between them. Near the end of the song, Prince goes on into a dialogue between him and a female presence, his twin, who is about to be incarnate. In Delirious, he describes a feeling of anxiety about a girl that he cannot seem to get under control. He expresses the kind of feeling that is synonymous with what a man feels when his woman is in labour and cannot contain his anxiety. At the end of the song, there is a sound sample of a baby laughing. The placement of this baby sound sample would seem to to be random, but to Prince, on a subconscious level, it was symbolic of my arrival in this world. The symbol would make its more obvious appearance in 1984, on his next album, Purple Rain, when it appeared on his motorcycle, and on his stage outfits. The symbol continued to evolve until 1992, when he asked his graphic designers to create for him, a distinct variation of the symbol that he could call his own and get copyrights to. This symbol appeared on the Love Symbol album. And he would later change his name to this symbol. In 1996, Prince went on the Oprah show to be interviewed, and he revealed some seemingly bizarre and private information about himself, that would now makes sense in the context of twin flames. He told Oprah that he felt that there was another person living inside him. He felt it since he was 5 years old, and that this being comforted him through out his early life. He also said that he felt that he changed his name to the symbol, because of this being, because it was truly who he was. The use of this symbol began in 1982, when I was born. Prince has also made references throughout his work, to an angel that watched over him. Prince has said to me, that it was me, who watched over him before I was born. And it is now he, who watches over me until the time comes that we fully reunite in spirit. Image above: “The One” by Prince in spirit.